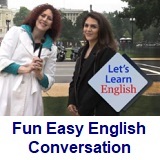 ﻿ Fun Easy English - new classroom free online classes english language lessons speaking listening writing reading january 25. 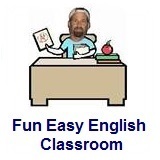 Today in the Fun Easy English classroom you are going to learn about American English idioms. Knowing the idioms used in American movies, television, and popular music is very cool. You will be able to understand native American English. An idiom is an expression whose meaning does not seem to follow logically from the combination of the meaning of its parts and the "rules of language." Idioms are often classified as figures of speech. Idioms are used extensively in American TV, movies, music, literature, and in conversations among native English speakers. She plans to "hang in there" even though she is taking eight classes this semester. The meaning of this idiom is to "continue despite difficulties." 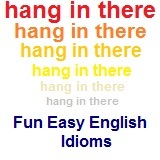 The words "hang in there" have completely different meanings when separated. in - Within the limits, bounds, or area of. there - At or in that place. Studying idioms is important in order to understand American TV, movies, music, literature, and conversations among native English speakers. International students who are studying English should not use idioms too often in their daily conversations with native American English speakers. Idioms are generally an unsophisticated form of expression and can sound very strange if overused and especially if used incorrectly. Conversation Lesson 25 - Watch Out!